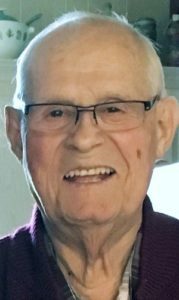 Eugene M. “Geno” Valesano, 81, of Lititz, passed away on Saturday, January 26, 2019. He was the husband of Doreen M. “Sue” Simpson Valesano, with whom he shared 54 years of marriage this past April 4th. Eugene, also known as Mickey, was born in Wakefield, MI, the son of the late Anton D. and Mary Landretti Valesano. Geno retired in 2000 after 20 years as a sales representative for Boart Longyear Ltd., an explorational drilling equipment firm. He also, with Sue, owned and operated the Blue Cloud Motel in Ironwood, MI, as well as taught school in the Utica and Roseville areas in Michigan. He also served in the US Army Reserves. A talented football player, Geno played and graduated from Northern Michigan University, where he was elected to the Wildcats Hall of Fame. He was drafted in 1961 by the Detroit Lions in the NFL and played for both the Lions and later the Toronto Argonauts of the CFL. He and Sue moved to Lititz 30 years ago and have been members of St. James Catholic Church. He loved to ride his motorcycle, and was a member or the Happy Pappys and Retreads motorcycle clubs. In addition to his wife, he is survived by his daughter Maria A. married to Gregory C. Gruett of Lititz, his two grandchildren Ryan and Gia Gruett, and his sister Virginia “Pat” married to Robert Cicero of Glendale, CA. he was preceded in death by his brother, Rudy Valesano. Gene, Geno, Mickey, dad, papa… regardless of who he was to you, he was family. He was loved by many because his smile was contagious and his heart was so big. Anyone that met him loved him instantly. He is the definition of what a hero is. Friends will be received on Saturday, February 2, 2019 from 10-11AM from at St. James Catholic Church, 505 Woodcrest Drive, Lititz, PA 17543 with the Mass to follow at 11AM. Interment in Witness Park Cemetery. In lieu of flowers, please make contributions in Geno’s memory to St. James Catholic Church at the above address or to St. Jude’s Childrens Research Hospital, 501 St. Jude Place, Memphis, TN 38015 www.stjude.org . At Northern Michigan University, beside being a great athlete, I enjoyed him as a very nice person. May God bless him and his family. Mickey was one of my best friends in high school. A superb athlete, he was also humorous, clever, and fun to be with. I will miss him very much! Condolences to Sue and the family, as well as his sister Virginia. Though we lived a great distance apart, we kept in touch. You will be missed. George and Jan Finco, New Berlin, WI. My heartfelt condolences to the Valesano Family. I have been around the Drilling Industry for 40+ years and can honestly say that ‘Mickey’ was one of the absolute best people in the industry and that I’ve had the privilege to know and work with. Even after his retirement, we remained in contact. He is an icon, a legend and a credit to humanity in every way. He will be greatly missed and never forgotten! May God Bless Him and His Family. Jeffrey Selvoski and family, and the employees and families of Test Boring Services, Inc.